oops! Sorry about February totally forgot, actually not sure anything much got done in the delcuttering department during Feb anyway. Even this month I was only able to tackle a few small areas of decluttering, but every bit helps. Third draw down in the kitchen, does everyone have one of these lol! A mess of kitchen odds and ends and way too many birthday cake candles. Much better. Containers are from Howards Storage World, love that store. Our games cupboard is a bugbear. It simply never stays tidy. Every six or so months I find myself having to reorganise this space. I keep seeing bloggers that have ditched the boxes from the games and are now storing them in ziplock bags, placed inside a container of some description. The end result is always a clean, clutter free space. This makes me panicky, ridiculous I know, but cutting and throwing away the boxes of the games does; even though I have considered doing this for a couple of years now I have never been able to take the plunge. This month I bit the bullet and headed out to KMart to pick up some baskets and large ziplock bags. I have a loooong way to go on this project. Our top draw in the ensuite, another embarrassment, but one that was quickly remedied. Yet again containers from Howards Storage World. These ones clip together but they don't stay together and often come apart, however they were alot less expensive than the ones I used in the kitchen draw. That's it for this month of decluttering around the home. I've been working hard on upcoming units for the kids, finding resources etc. I personally am just finishing off a seven day internal cleanse/juice fast and definitely feel a whole lot better for it. What about you? Done any decluttering this past month? I dont think i could do that to the game boxes. The kids spy the games and puzzle bookcase through the day and choose from the display (boxes stacked on top of each other) Mind you i declutter, rearrange and bring out new for old from cupboards everyweek. My bathroom cupboard dosnt have any drawers....so you can imagine what falls out when you open a door! My work room looks like someone just took a giant fan and blew stuff everywhere right now! I can't even think when I am this unorganized!! I went through our books last month. Didn't get rid of many, but we packed away a ton of them, and we're doing a seasonal rotation with the picture books now. So much nicer, and the kids actually pay attention to the "new" books we have out now. I did that with my oldest's puzzles a few years back. It was so nice! But I don't know if I could do that with games, but it really works well for puzzles. Wow - you are brave showing the world your "before" photos! 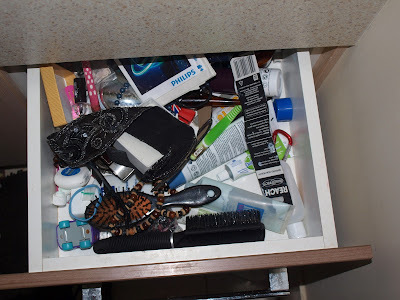 I decluttered our sideboard draw in the January holidays. It's something that never goes away! Thank you for the detailed and encouraging message you left in the comments of my homeschool questioning post. And, thank you for this decluttering post on your blog. I am always amidst trying to declutter and seeing your small bites of progress encourages me. i have a little job for you K when u come up!! LOL!!! That game idea is amazing. Did you just use gallon size zip close bags? I think I want to do that before we move to save space, but I don't want to screw up!